All Let’s Relax treatments are meticulously designed to take our guest to the height of relaxation and relieve stress. Similarly, our spa packages let guests enjoy sets of spa treatments that suit their specific desire. The standardized massage technique makes sure you experience Let’s Relax Spa’s original service every time, everywhere by our certified therapist. Dr. Spiller 10-Step Facial Soothing Massage Treatment will deeply cleanse your skin by using Dr. Spiller’s make up removal, Aloe Vera Sensitive Cleansing Milk, Jojoba Peeling Cream Scrub, and Sensitive Aloe Toner to prep your skin for pampering ritual. After your skin is perfectly clean, the therapist will apply highly concentrate ampoules of choice that you can choose from Aloe Vera Concentrate Ampoules – for all skin type, Aloe Vera Skin Lift Ampoules – for firmer skin, Propolis Vitamin A Ampoules for impure and acetic, enlarged pores, oily combination skin, and Repair Ampoules – for anti-aging and preventive skin care, followed by Eye Contour Gel, Apricot Lip Balm, Honey St. John Wort Cream Mask to prevent roughness with strong anti-inflammatory properties, Aloe Vera Jelly Gel to improve hydration. Next Step, the therapist will gently massage your face to improve your lymphatic system and skin lifting while using Aloe Night Cream to increase elasticity and firmness of the skin and finish the treatment by applying Aloe Day Cream for moisture protection from environmental drying. This massage technique utilizes finger pressure along with the hands and elbows on tension areas of back and shoulder. Guests get to sits on a specially designed massage chair that gives full comfort after the massage. The treatment is good for jet lags, eases strain and tension, mobilizes stiff joints, and improves blood circulation. A great treat after a long day of office work. This spa treatment exfoliates the dead skin cells using various combination of sea salt, essential oils, water, skin brush, or loofah. Guest can choose from the selection of 6 types of scrub that best suited with their type of skin. The treatment is found to nourish the skin, improve circulation, cleanse and tone even the most sensitive skin. Cleanses and improves the complexion of your cherished face. 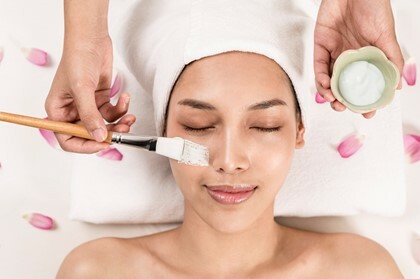 The treatment includes gentle exfoliation application of facial mask and moisturizer and a facial massage. Suits anyone who yearns for a brighter and healthier facial skin. After a regular Four-hands Thai massage, a warm pouch of steamed Thai herbs is pressed against the body meridians. This type of herbs is said to be particularly good for sore muscle, aches, increase blood circulation, and toning the skin. This finishing touch, along with four-hand massage, takes you to the height of relaxation. Thai Herbal Steam Sauna is a treatment which uses steaming with herbs. It is believed to soften the skin, helps cleanse body impurities and relax the muscles. The treatment is usually followed by a cold plunge or shower to restimulate the whole body. Perfect your spa experience at Let’s Relax with a private time in the whirlpool bath sprinkled with tropical flower petals after your treatments. A great way to pamper and ready yourself for days to come. Our Bangkok onsen facility provides hot bath enriched with powerful luxurious minerals imported from Gero spring, Japan that continuously protect, heal, and rejuvenate the body at cellular level leaving the body and mind healthful, rejuvenated, refreshed, relaxed and clean. Guests also have full-day access to enjoy other facilities such as sauna, steam, warm Himalayan stone room, and cold rooms. 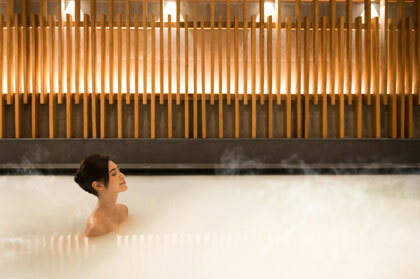 Feel the rejuvenating effects of onsen in Bangkok at Let’s Relax Onsen and Spa Thonglor. Blooming Life package lets our guest relax and revitalize the skin with 60 minutes of Body Scrub or Body Wrap, followed by a 60-minutes Aromatherapy Oil Massage. Next, the guest gets to relish with 60-minutes of Dr.Spiller 10-Step Facial Soothing Massage that massage and gently exfoliate the facial skin of dead cells. Its the salubrious renewal of the skin, our largest organ, from head to toes. Only available at selected branches, this 3-hours deluxe package emphasizes on the relaxation of mind. The mixed herbal scent during the 30-minutes Thai Herbal Steam takes the guest away from stressful thoughts. The 90-minutes hot stone massage promotes deep tissue relaxation. The final 60-minutes Dr.Spiller 10-Step Facial Soothing Massage put an end to all stress as well as brighten facial skin. It’s a perfect indulgence after a long week of strains at the office. First, the guest bathes in the jacuzzi filled with tropical flower petals. The warm water expands pores and readies the skin for upcoming treatments. The next step is either a 60-minute body wrap or body scrub, followed by 60-minutes Aromatherapy Oil Massage. She then finishes off with Dr.Spiller 10-Step Facial Soothing Massage treatment. It’s a wholesome renewal of from the outer-body to within, from head to toe. A half-day spa ritual that you won’t forget and certainly the one that all spa-goers yearn for. First, the guest bathes in the jacuzzi filled with tropical flower petals. The warm water expands pores and readies the skin for upcoming treatments. The next step is either a 60-minute body wrap or body scrub, followed by 60-minutes Aromatherapy Oil Massage. She then finishes off with Dr.Spiller 10-Step Facial Soothing Massage treatment. It’s a wholesome renewal of from the outer-body to within, from head to toe. A half-day indulgence of an unmatched spa experience. Guests get to starts the day with either a 60-minute body wrap or body scrub, followed by 60-minutes Dr.Spiller 10-Step Facial Soothing Massage treatment. She then finishes off with a 90-minutes Aromatic Hot Stone Massage. Revitalization of the skin, the face, and the deep muscle tissues leaves makes you feel like having a fresh, new body, a privilege that only a few have experienced. Only available at selected branches, this exclusive spa program lets the guest enjoy the lush of Thai Herbs, carefully mixed and match to make the perfect, relaxing scent. The treatments consist of 30 minutes of Thai Herbal steam followed by a 2-hour Thai Massage with hot herbal compress. Due to the tropical ingredients used, one would not easily find the opportunity to experience this outside of Thailand. Only available at selected branches, this 3-hours deluxe package emphasizes on the relaxation of mind. The mixed herbal scent during the 30-minutes Thai Herbal Steam takes the guest away from stressful thoughts. The 90-minutes hot stone massage promotes deep tissue relaxation. The final 60-minutes Facial Relaxation put an end to all stress as well as brighten facial skin. It’s a perfect indulgence after a long week of strains at the office. A half-day spa ritual that you won’t forget and certainly the one that all spa-goers yearn for. First, the guest bathes in the jacuzzi filled with tropical flower petals. The warm water expands pores and readies the skin for upcoming treatments. The next step is either a 60-minute body wrap or body scrub, followed by 60-minutes Aromatherapy Oil Massage. She then finishes off with Facial Relaxation treatment. It’s a wholesome renewal of from the outer-body to within, from head to toe.